Delta to Star (Δ to Star) resistance conversion calculator - formula & step by step calculation for triangle to equivalent star resistance conversion. R1 = (RbRc/(Ra + Rb + Rc); R2 = (RaRc/(Ra + Rb + Rc); R3 = (RaRb/(Ra + Rb + Rc). Resistors Ra, Rb & Rc in ohms are the key elements of this calculation. 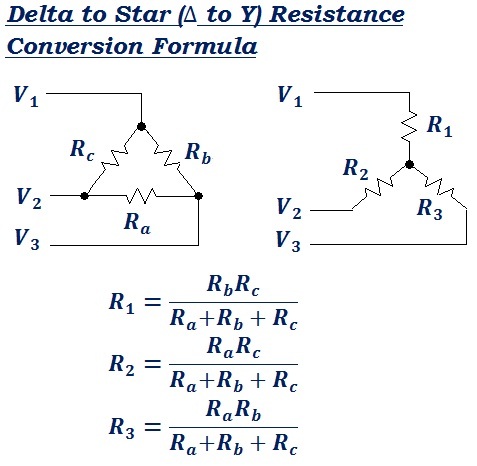 In electrical & electronics engineering, the below mathematical formula is used to convert the delta resistance to equivalent star resistance. In the field of electrical engineering, sometimes it's important to find the equivalent resistance in star circuit from the given delta circuit. The above formula & step by step calculation may useful for users to understand how the values are being used in the formula, however, when it comes to online for quick calculations, this Delta to Star (Δ to Y) resistance conversion calculator helps the user to perform & verify such calculations as quick as possible.